The people who are responsible for accounting department of the company are fully aware of the two terms Provisions and Reserves. They are totally different in nature but some of us think they are same. 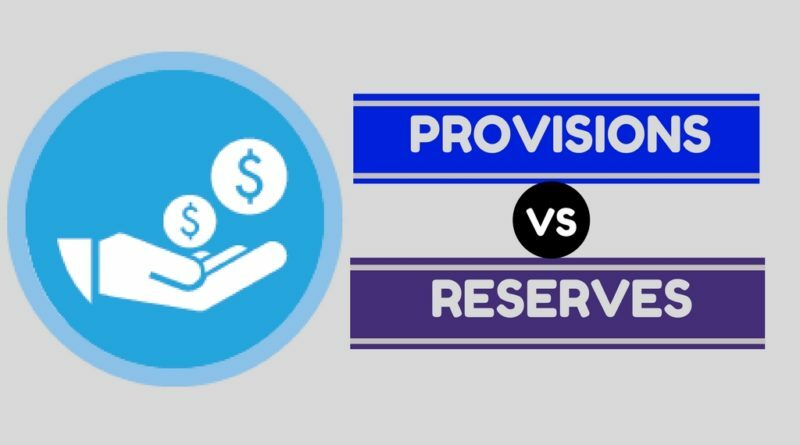 The main aim of this article is to interpret the difference between Provision and Reserves for a better understanding of these two terms. Provision is the term which refers to the money which is written off in the accounting books to cover certain expenses and losses which occur in the given accounting period. Actually, the amount written off is not incurred to the company but expected to incur in the current accounting period. Provisions are made to ascertain the true net profit of the company. ⦿ Provision for tax, etc. Reserve is the term which refers to the amount of money from the profit which is set aside to meet the future needs or problems of the company. Actually, the reserves are also called as retained earnings because some part of the earnings are retained by the organization and kept in the form of reserves to meet the future requirements of the company. Reserves impact the returns of the shareholders. i.e some part of the profit is retained by the organization and kept as a reserve which reduces the profits available for distributing among the shareholders. The reserves are of various types and are used for various purposes and some of them are. The Provisions refers to the money which is set aside for a known liability or expense. The Reserves refers to the money which is kept aside for future needs of the company. Provision is mandatory for every business as per accounting principles to ascertain the fair view of the profit of the company. Reserves are not mandatory and solely depends upon the choice of the management but there are some specific reserves which are to be maintained as stated by the law. Provision is actually a charge against the profit of the company. Reserves are considered as a sum of money allocated officially for a particular use from the profits. Provisions are recorded on the liabilities side and sometimes on the assets side as a negative asset. Reserves are entered on the liabilities side after capital because reserves come under owners equity. Provisions made are deductible from the taxable profit and helps the company by reducing the taxable profit. Reserves are created after the tax on profit is paid and reserves don't have an effect on taxes. The money set aside for provisions cannot be used for payment of dividends for shareholders of the company. The money set aside for the reserves can be used as dividends if the reserves remain unutilised for some period. Provisions which are made reduces the net profit of the organization. Reserves which are set aside reduces the profits for dividend distribution. Provisions and reserves are widely used in businesses as a measure of protection from uncertainties. The reserves made can be employed for various uses and sometimes they are used to meet working capital requirements and sometimes they are invested in the outside securities which generate additional revenue to the organization. Whereas Provisions made are only written off in an estimation of the doubtful debts or depreciations, etc.